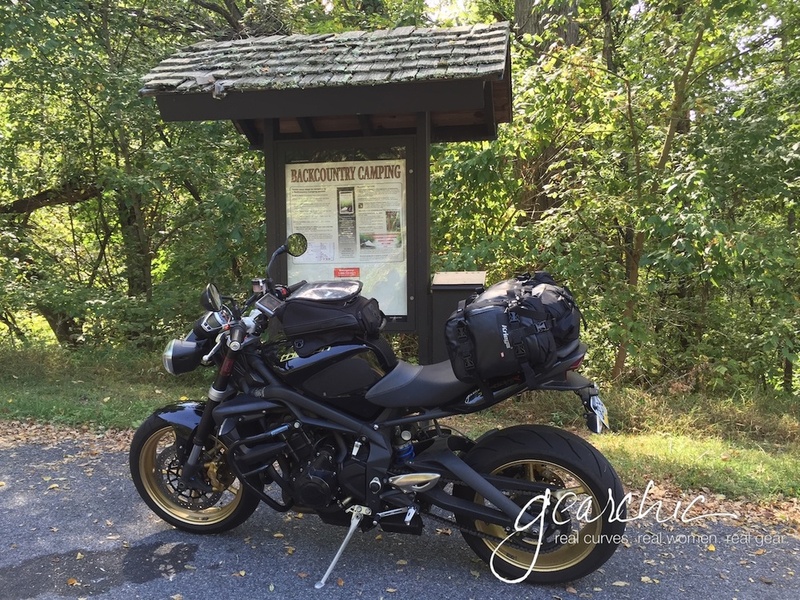 Since this review, I've upgraded to a 2012 Triumph Street Triple R. It works as well as it did on my SV! It works exactly the same, without problems. I still adore my Kriega packs and can't say enough good things about them. 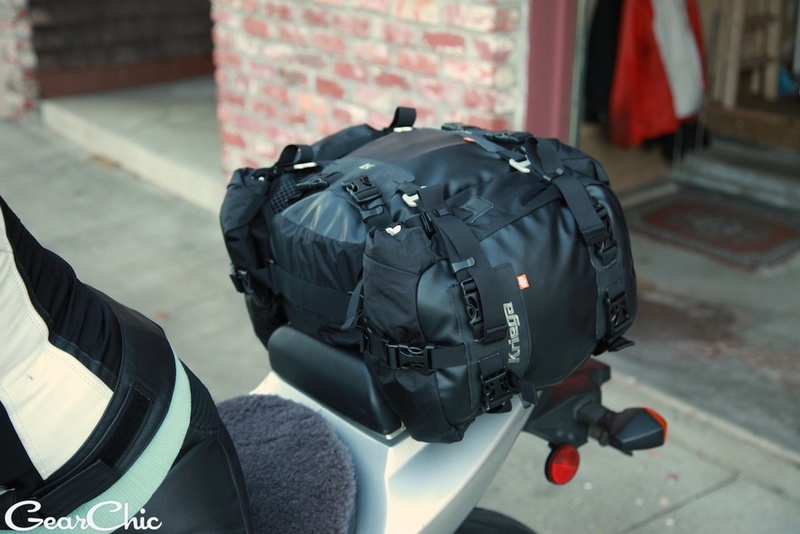 Ok, you're probably wondering how on earth do these modular packs work together to make the best kickass system for your tiny sportbike's rear seat? Well, let me show you. If you ride any kind of sportbike, you know that a generous rear seat to allow for mountains of luggage is nonexistent. You also know that piling a ton of luggage on the backseat is the worst way to throw off your center of gravity and make for a terrible ride. 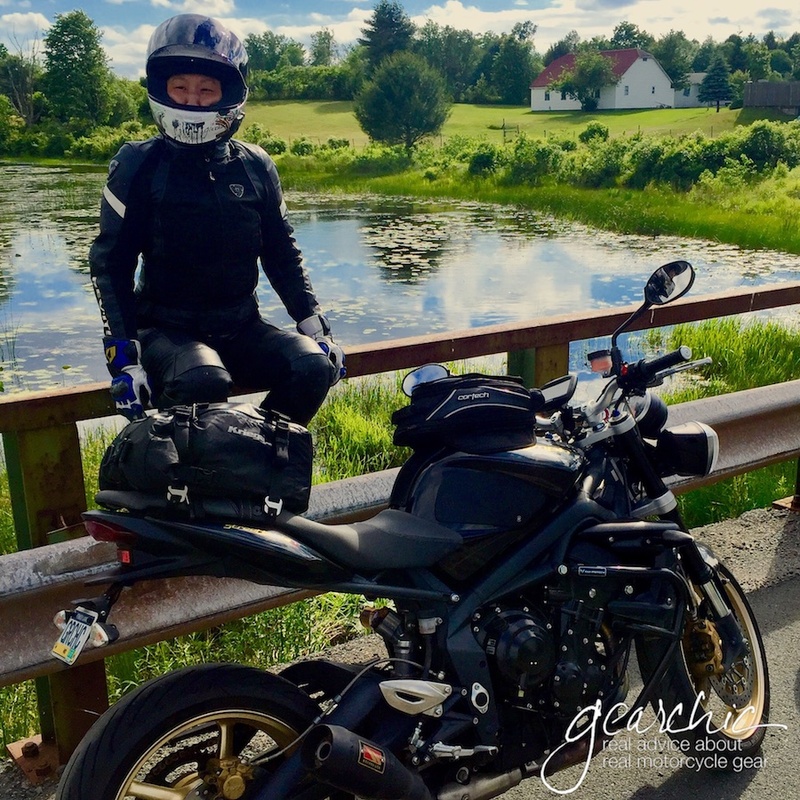 Anytime you pile your gear on the back seat, you're in for a heavier rear end, higher center of gravity and with saddlebags, a loss of swerve clearance. You have to swerve much harder to get around tight corners. 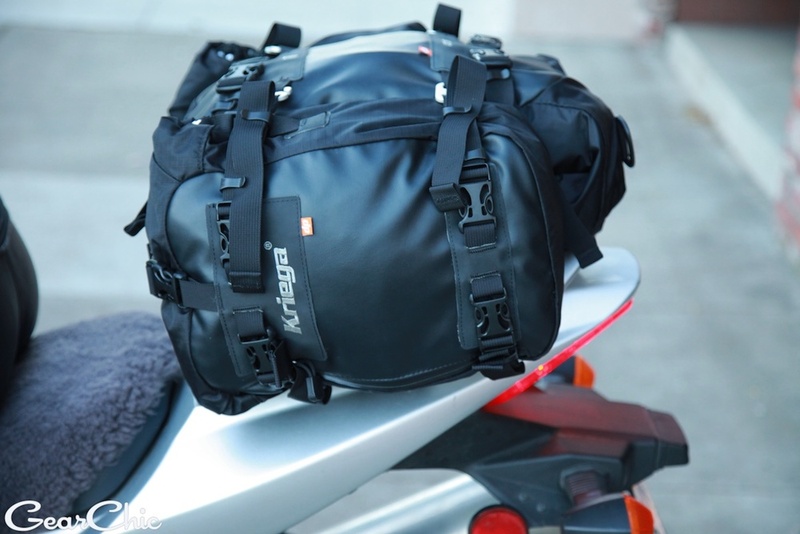 Last fall Kriega offered me their modular kit for a long 1,000+ mile ride to Nevada with some friends. I wanted to get away from having saddlebags since I've burned them all on the stock exhaust of my previous ride ('03 Suzuki SV650S). This system offers 40L of storage when completely filled. Considering my saddlebags only offerd 25 liters, at least I'll be getting more space! I actually didn't have enough clothes to completely pack these bags. I actually overpacked for a 3 day weekend but there was still plenty of room. So if you look at the first pic above, you'll see there are two packs; a US-20 and US-10. Basically there's a US-10 attached on either side of the US-20. Voila. 40 Liters. The beauty of this setup is that the US-20 is connected securely to the seat, not with bungies or nets, just 4 perfectly placed alloy hooks that the US-20 connects to. As you can see, the hooks are barely visible. Nothing is hitting my turn signals, and if I had crazy high mount exhausts, nothing would be touching these bags. Since they're designed as a drybag, that means you stuff them like a sack of potatoes and roll down the top and buckle down each side so nothing is getting inside these bags. I wouldn't advise putting their US-30 on your rear seat because it'll simply be too long. The US-20 sits lengthwise since it would hang over the side too much. You might also be wondering what about the security factor? Well, with any soft bags you certainly have that to deal with while traveling. I just rolled with it, and since I was with friends I knew my belongings would be okay. People tend to be nice to you when you're on two wheels it seems. I know what you're thinking, how do you get in and out of those bags? For quick access items, I used my handy tankbag for all those necessities. But getting in the mainbag isn't too tough, just unbuckle the side and roll it open. 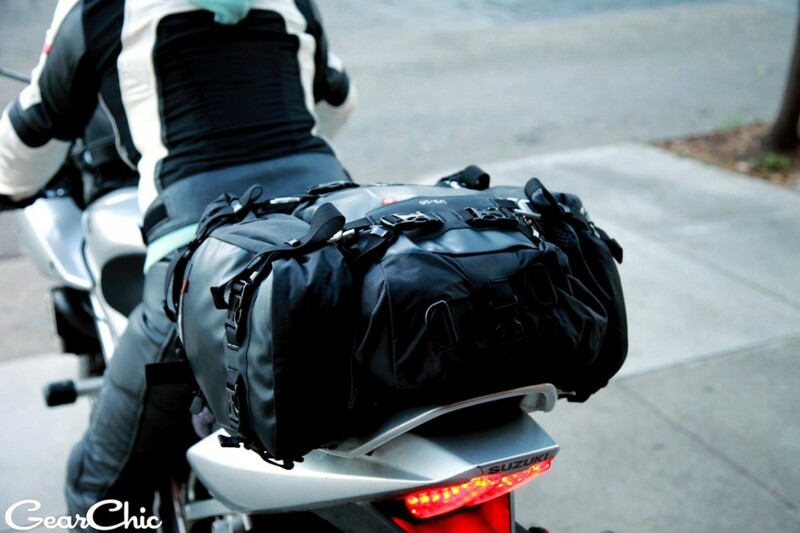 Each bag comes with all the necessary straps to mount them individually to your bike. 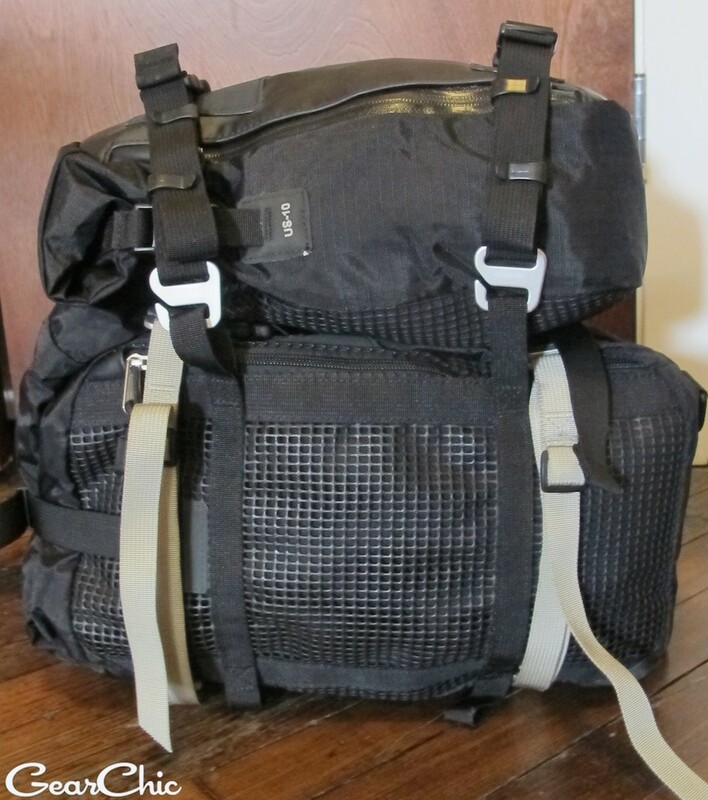 Although only the US-20 and US-30 come with a shoulder strap. I would say the US-10 is large enough to hold a pair of sneakers and a hoodie at most. I could see myself using this system to travel for almost a week. So where do all these hooks and straps go? I've attached instructions on the right (Steps 1-2-3) which illustrate the simplest method which is laying the straps across the tail after you've removed it. Of course you'll want to shorten the straps so they barely peek out of the seat but hopefully you get the idea. This is the primary method I've used on several different bikes I've ridden including the BMW R1200R. It doesn't matter what kind of bike you have as long as you have the ability to remove the seat. When you place your straps under the seat, you will have 2 sticking out on each side. You can place your bags lengthwise or 90 degrees like I do. It just depends on what works best for your bike/situation. Since my Triumph has a short rear end it makes more sense for me to run it 90 degrees. Plug one alloy buckle into each of the 4 clips on top. The alloy buckles then loop through each grey strap, 2 on each side. Cinch down and you're done. 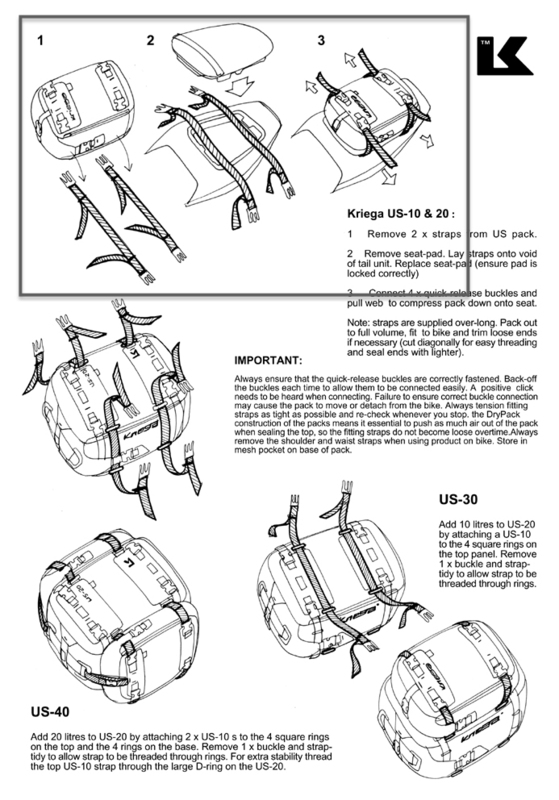 But, if you are attempting the full 40L setup, then you need to attach a US-10 (or US-5) to each side . Then attach another set of (4) alloy buckle straps to the US-10 and there will be 4 loops for the alloy loops to go through. There's plenty of extra strap to cinch things down and little strap holders to keep the excess from flapping about. I never had a problem with them coming loose, or coming close to falling off. As long as they were cinched down, they were secure. When you place the straps under the seat, you don't want extra slack so make sure the seat straps are only as wide as the seat itself. This also ensures a snug fit. I can't see myself going back to traditional saddlebags or a separate tailbag after using these. They're rugged, durable and very easy to use. If you need extra straps, you can certainly order those separately. Which I will have to do since I seem to have lost one strap during my cross country move. I rode with the Sisters' Centennial Ride this summer and had the chance to ride a 2016 BMW R1200R along with my US-20 pack :) I flew to San Francisco on a Thursday night and spent the next 2 days riding from Carson City into San Francisco. It worked incredibly well. I flew to California to join the Women's Sportbike Rally in Big Bear and luckily a very generous friend of mine also rides a Triumph Street Triple R so I borrowed it. I brought my US-20 with me, but forgot to bring my 10s so I ended up purchasing another US-20 and put it on the side. I don't recommend this since the weight of the pack on one side can be annoying to cinch down properly. It just felt too heavy. And I didn't want to raise the center of gravity so I didn't stack them. They looked pretty good but I didn't like the way the bag hung off the side. At one point it was sagging a bit on the exhaust. I pulled the straps as tight as I could and tried to lighten the load of the side bag but so it worked better. But I just wouldn't recommend this setup. I much prefer my usual 20-10-10 arrangement.